Careful how you head out for the day! Dubbed Analemma, the fanciful tower wouldn’t be built on the ground, but would be suspended in air by cables from an asteroid repositioned into geosynchronous Earth orbit just for the purpose. Clouds Architecture Office, which recently partnered with NASA to design a Martian habitat dubbed Mars Ice Home, envisions that the tower would be constructed in Dubai, site of the world’s tallest building, Burj Khalifa. Analemma would be powered by solar panels and use recycled water. Lower floors would be set aside for business use, while sleeping quarters would be sited about two-thirds of the way up. The plans don’t say exactly how people would get on and off the building, though one illustration seem to show people parachuting from the tower to the ground. Anyone venturing to Analemma’s highest reaches would be treated to extra daylight — about 45 minutes more at an elevation of 32,000 meters, according to the plans. Of course, tenants who ventured that high would need a spacesuit to go outside because of the near-vacuum and temperatures estimated to be about minus 40 Celsius. "Harnessing the power of planetary design thinking, it taps into the desire for extreme height, seclusion and constant mobility. If the recent boom in residential towers proves that sales price per square foot rises with floor elevation, then Analemma Tower will command record prices, justifying its high cost of construction." Presumably, much of the anticipated cost would come from repositioning the asteroid to which Analemma would be moored. No one has ever tried such a feat, although NASA has plans to do so with its Asteroid Redirect Mission. And as the plans point out, the European Space Agency’s Rosetta mission showed in 2014 that it’s possible to rendezvous with a distant asteroid. But not everyone is ready to jump aboard the Analemma bandwagon. 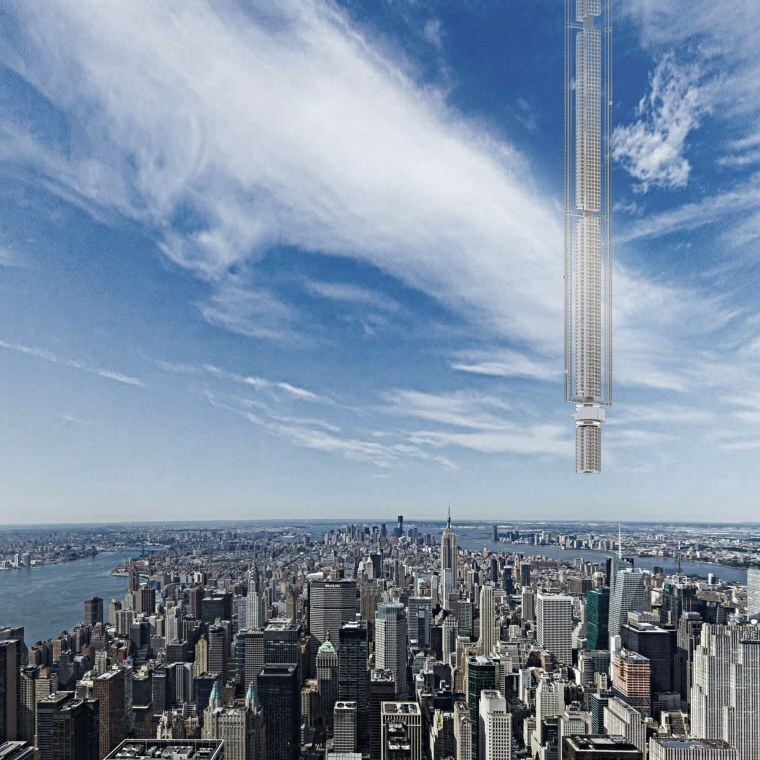 In an email to NBC News MACH, Carlo Ratti, director of MIT’s Senseable City Lab and an architect noted for futuristic thinking, called the tower a “fun utopian mega-project” but said a cable suspended from space would break under its own weight. And beyond feasibility, Ratti expressed philosophical doubts about the very idea a suspended skyscraper. But to Ostap Rudakevych, a partner at Clouds Architecture Office, buildings like Analemma are all but inevitable. "If you look at the history of architecture, buildings have been getting taller and lighter over the past thousands of years," Rudakevych told NBC News MACH in an email. "In the past two centuries we've had the aerial age and space age begin. So our belief is that it is only a matter of time before buildings become ungrounded."